I'm so glad pasta salad season is back. 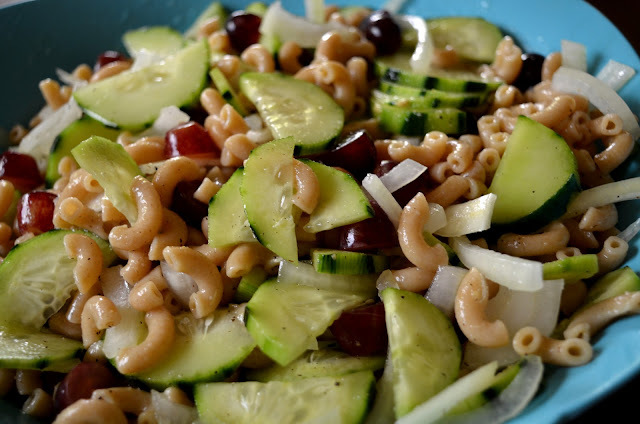 And by pasta salad season, I mean summer. 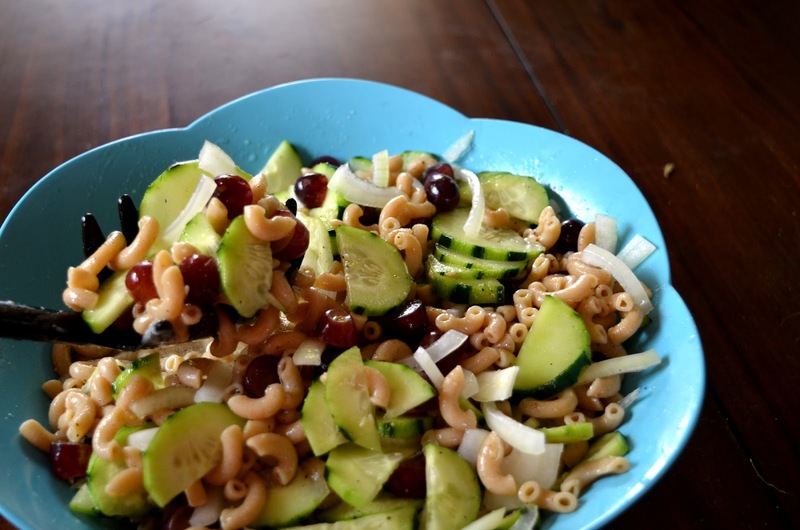 Warm sunny days were made for grillin' and my favorite of all the side dishes - pasta salad. So when I found this recipe on Pinterest, I knew I had to make it. It was the first pasta salad of the season for me. 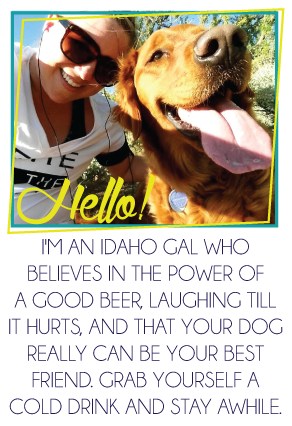 And with the extra kick of crisp sweetness from the cucumbers and grapes, it's going to continue to be on rotation! I decided to add the grapes on a whim. It needed some extra color. I think they change the whole dish and bring just enough sweetness and texture. The other great thing? No dairy. No mayonaise. Just a light vinigary dressing with a kick. Based losely on this recipe from My Life and Kids. Cook noodles according to package. Cut up ingredients while pasta cooks. Run cooked noodles under cold water. 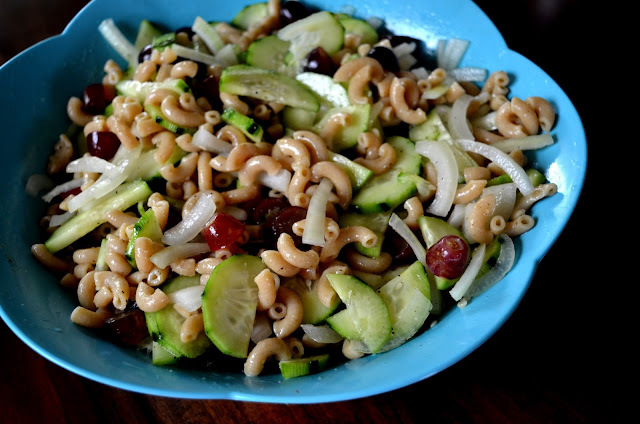 In a large bowl, combine with onion, cucumber and grapes and mix in oil. In a separate bowl combine all other ingredients as the dressing. Pour on salad and stir till well covered. Cover bowl and store in the fridge for at least an hour before serving. I ended up added a can of chicken to it as well to up the protein value. It was perfect for my packed lunches! What do you think? 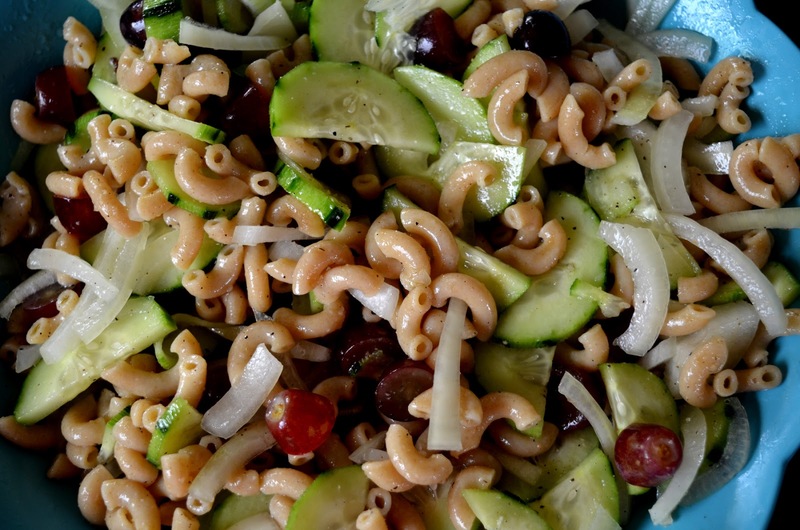 Are you a pasta salad fan? Let me know if you try it out! As much as I love pasta, I usually don't like pasta salad, but this looks good. I wonder how it would be with cheese-filled tortellini. This looks really good. I'm a big fan of pasta salads. Girl, you are KILLING ME with this recipe!! And like you said, emphasis on pasta. Carb-o-holic over here! This looks soooo good. Ooooh buddy that looks good! I can't wait to make it for my lunches, too! YUMMM! 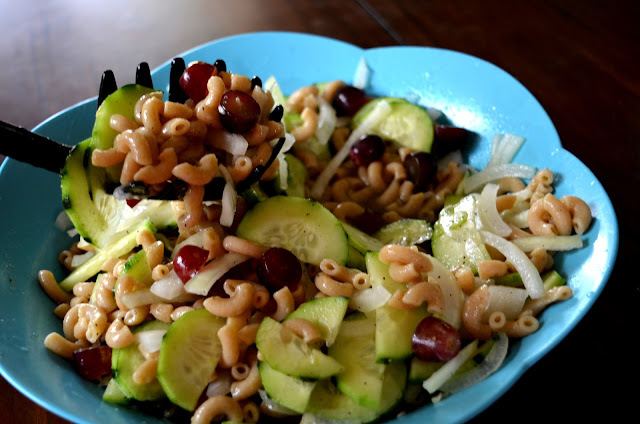 I could eat Pasta Salad every single day throughout the summer. Pinning this to make this Summer!